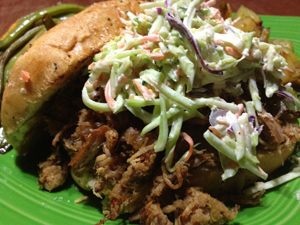 Cook: North Carolina Style Pulled Pork | CookDrinkFeast! When my family says “barbecue,” they don’t mean burgers and hot dogs on a grill. They mean pork that has been cooked low and slow with a vinegary sauce, chopped or shredded, and served on a white bun with hot sauce and coleslaw. The rest of the world refers to this as North Carolina style barbecue. Eastern North Carolina to be exact. I grew up in southeast Virginia, but my family—like so many others—moved from North Carolina a few generations ago. I no longer order barbecue sandwiches anywhere outside of North Carolina or Virginia because they are always done incorrectly. The sauce tends to be too sweet with some sort of tomato product. This is all sorts of wrong. So, what’s a girl with a craving for barbecue, and no grill, to do? For years, I have made an ersatz barbecue in a slow cooker. While tasty—the result was a little watered down. Slow cookers produce a lot of liquid, which I usually had to boil off. There had to be a better way. So, I asked the trusty Internet. I came up with a plan after doing a bit of sifting. 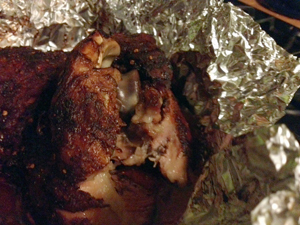 I coated half a picnic shoulder in a dry rub, and then I cooked it low and slow in the oven while basting it with a vinegar-based sauce. The verdict: I will be making my ‘cue in the oven from now on. Cut skin off of the picnic shoulder—leaving a ⅛ inch layer of fat. Combine the rub ingredients. 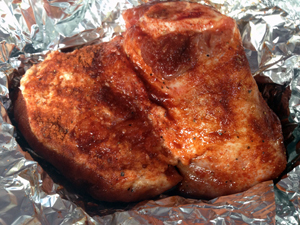 Cover the picnic with a generous coating of rub and wrap it with aluminum foil. The best method to use is to make a large + sign with two sheets of foil, and then set the seasoned picnic in the center. Close each piece of foil to make a packet. Let the picnic rest in the refrigerator for at least an hour while you make the sauce. Combine the sauce ingredients in a small saucepan. Bring the mixture to a boil over medium heat. Once it starts to boil, turn the heat down to low then let the sauce simmer for 15 minutes. The sauce should be slightly reduced. Remove the pan from the heat and let the sauce cool. Once cooled, separate ⅓ of the sauce into a small bowl for basting. Put the remainder in a small jar. Place the wrapped shoulder in a roasting pan (I actually used my big cast iron skillet). 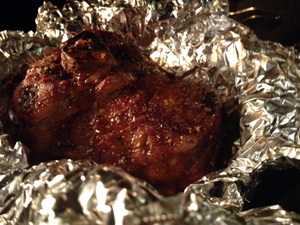 Open the foil and place the seasoned picnic in the preheated oven. Roast the shoulder 9 hours. Paint the sauce onto the picnic with a basting brush once every hour. After nine hours, close the aluminum foil and roast the picnic for another additional hour—until the internal temperature reaches 190° or until the bone can be wiggled easily. Place the cooked picnic into a large bowl. Remove the bone, and then shred the meat with two forks. You may want to Julienne the crispy bits of fat from the edges to disperse the spicy goodness throughout the barbecue. Pour the reserved sauce over the pulled pork and mix well. Serve barbecue on hamburger buns topped with hot sauce and coleslaw.